I’m always looking for tricks to improve my writing. One trick I learned a long time ago involves culling excess verbiage from my prose. Being technologically inclined, I thought up a way to have my computer catch me every time I use such words. Mark Twain might be proud. Autocorrect was meant to help people avoid spelling mistakes. You can also use it to type boilerplate text, i.e. words or phrases that you write regularly, using just a few keystrokes. 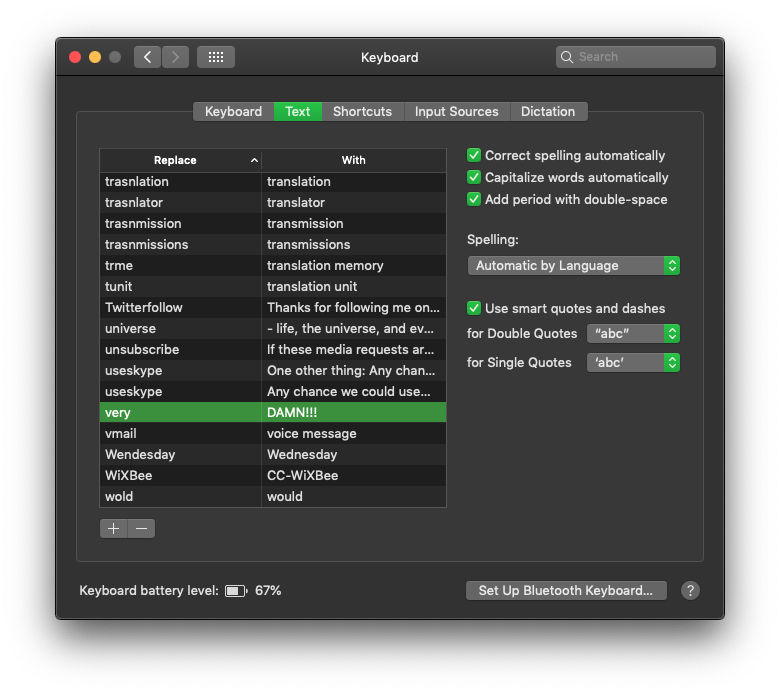 If you need instructions on how to set this up on your Mac, check out this blog post. By the way, any shortcuts you create here automatically work on any other macOS or iOS device logged into your iCloud account, so you don’t need to recreate these shortcuts on those devices. The screen shot above does not show all the phrases listed (e.g. “Twitterfollow,” “useskype,” etc.). If you’d like me to share those phrases, let me know and I’ll update this post with them. Do you use autocorrect this way? What are your favourite uses for autocorrect? Let me know in the comments below. By the way, I copied the quote at the start of this blog post from a page listing a bunch of Twain’s quotes. Visit the page. It’s worth taking a few minutes to read them all.